A favorite gift of mine (to give and receive!) is jewelry. Now, I’m not really a fine jewelry person. In fact, the only pieces of fine jewelry I own are my wedding ring and my engagement ring, and the necklace my husband gave to me as a gift on our wedding day. My husband knows that I change my jewelry as often as the the weather changes in Franklin (read: often. also read: it’s happening this week). To keep up with the shifting jewelry winds in my world, I discovered recently that I was just throwing these bobbles about to and fro with no real “home” in mind for them. Thus, I determined that it was time for a jewelry solution, especially for my earrings. The result? 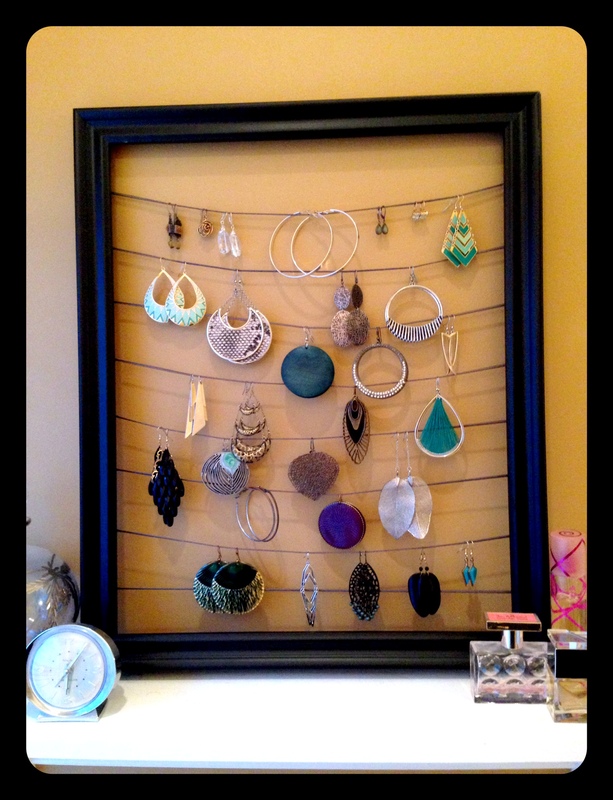 A fantastic, do-it-yourself jewelry organizer that was super-duper easy to make! Get a cheap frame from Goodwill or your favorite bargain store (I got mine for $4.99!). Look for something that is at least 8×10 or bigger. If needed, spray paint the frame your desired colour (mine is black). Purchase a spool of sturdy ribbon or cord. I grabbed a silverish-gray mouse tail cord at Hobby Lobby. Cut the ribbon/cord into strands as wide as the frame. On the back-side of the frame, make pencil markings all the way down the left-hand side 2-3 inches apart starting at the top to mark where each strand will be placed. 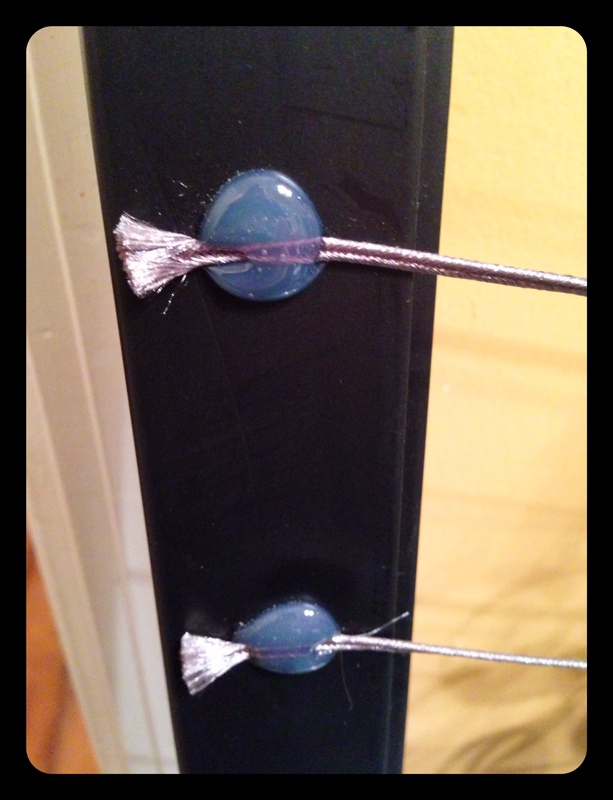 Get out your hot glue gun and while still on the back-side of the frame put a dollop of glue where the first pencil mark is and immediately hold one end of the ribbon/cord in place until it is dry (it’s super important to make sure it’s dry). Continue this process with each strand of ribbon/cord until you get to the bottom of the frame. Go back and cut off the excess ribbon/cord on the right-hand side. Voila! A functional and cute jewelry organizer! Ronda is a paleo-friendly blogger, diy-er, organizer and event planner. 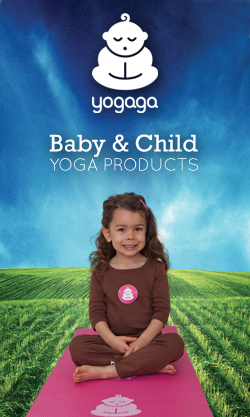 You can learn all about her and her many skills at therefurbishedlife.com.